I realize that the title of this post is kind of misleading. When you see the word creamy, you probably imagine a rich and creamy soup, full of…well, cream. In actuality, this soup is thick and rich. However, it is not only devoid of cream, but it’s pretty healthy. I’ve been making this soup for years, and it is one of my all-time favorites. While this soup is delicious all year round, the flavors and colors are absolutely perfect for fall. And because this soup freezes magnificently, I freeze it in single servings, and pop one in the microwave when I come home from work late on a frigid fall or winter night. This soup is thick and filling, and warms you right to the very core. Best of all- it’s super simple to make. Cut up your butternut squash. This is the tough part, but don’t let the big scary vegetable stop you. Or buy pre-chopped butternut squash. I won’t tell anyone. You don’t need to make your pieces very small, you’re going to puree it all in the end anyway. The peel and cut your carrots and sweet potatoes. Stop for a minute to enjoy the beautiful orange colors. Then dump them in your pot. Mix everything together. Add some spices and liquid and bring it to a boil. Turn the flame down and forget about it completely while you go to Costco. When everything is soft, let it cool a bit, then puree it with an immersion blender (best kitchen tool ever!). Heat oil in a large pot. Dice onions and fry over medium flame until translucent. 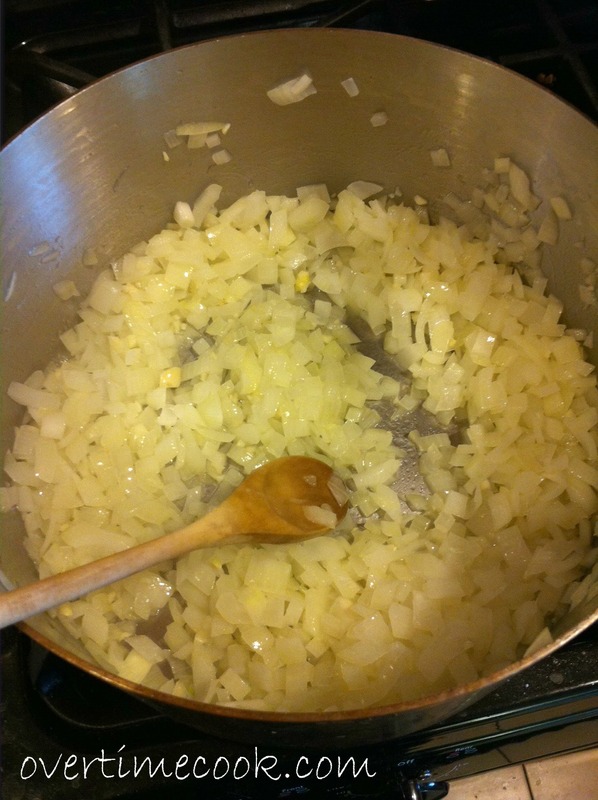 Add minced garlic. 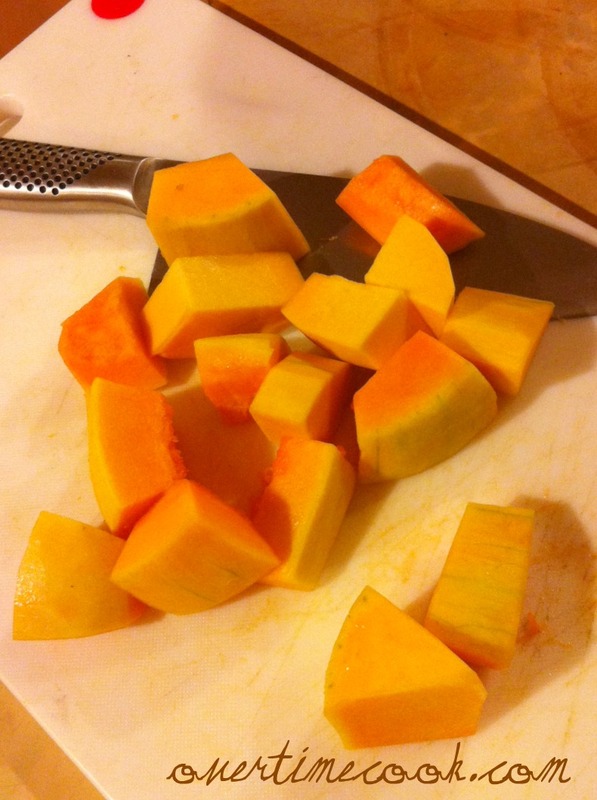 Peel and cut butternut squash into large cubes (about an inch) and add to pot. Peel and chop carrots and sweet potatoes. Add to pot. Stir to combine. Saute on medium flame for about 20 minutes, or until vegetables appear to soften a bit. Add broth, water, salt and pepper. Bring everything to a boil, then turn the flame down to a simmer. Leave it to boil for about 2-3 hours, until all of the vegetables are tender. Turn the flame off. When the soup is cooled somewhat, puree it with an immersion blender, or in batches in your ordinary blender. Add some water (about 3 cups, depending on how much boiled away and how thick you like your soup) until you reach your desired consistency. Serve hot. When reheating, you may need to add some water to prevent the soup from becoming too thick. Opinions please: I love the idea of taking step by step photos of my recipes, but often wonder if it’s worth the extra work. Please let me know if you find the photos in this recipe, or in recipes in general, useful. I think the step by step pics are great for more complicated recipes. Thank you for linking this up to Squash Love Blog Hop! A warm welcome ;-). So good to see another variation of pumpkin soup and this time without the cream. I make this soup, too, and it’s always terrific. As far as the step-by-step photos, they’ve been really helpful in certain recipes (potato knishes coming to mind). In others, this one included, they aren’t as needed but still add nice visual variety. And I love your bowl. Am I simmering this soup with lid on or lid off??? I simmered it loosely covered with foil; I made it in a huge pot that doesn’t actually have a lid. You should be able to cover it or uncover it, either way keep an eye on it. I know I would LOVE this soup after reading your recipe! YUMMY! Beautiful soup! It looks creamy to me and good and tasty! I tried this soup and it is really delicious. Perfect for the winter (and anytime- it’s that good). Thanks! Can’t wait to try this. 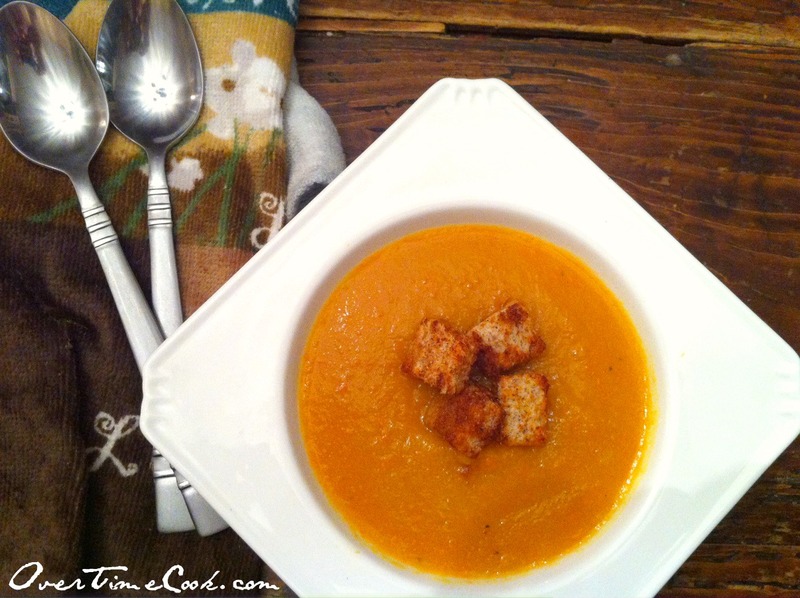 I’ve been waiting for another soup from you, your pea soup is a family favorite already! 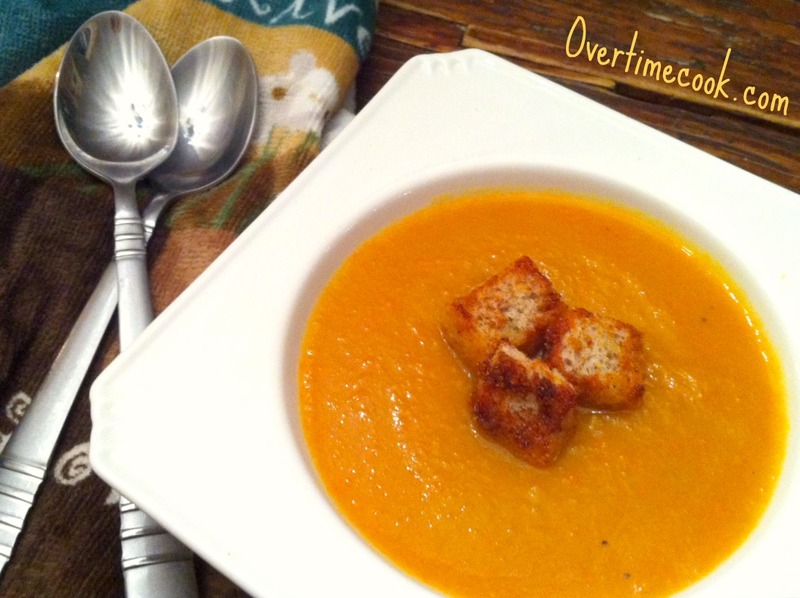 Need some good wintry soup weather and a free evening… mmm. Was directed here from More Quiche, Please. How did you know that I was looking for a great Butter squash soup? Looking forward to trying this. 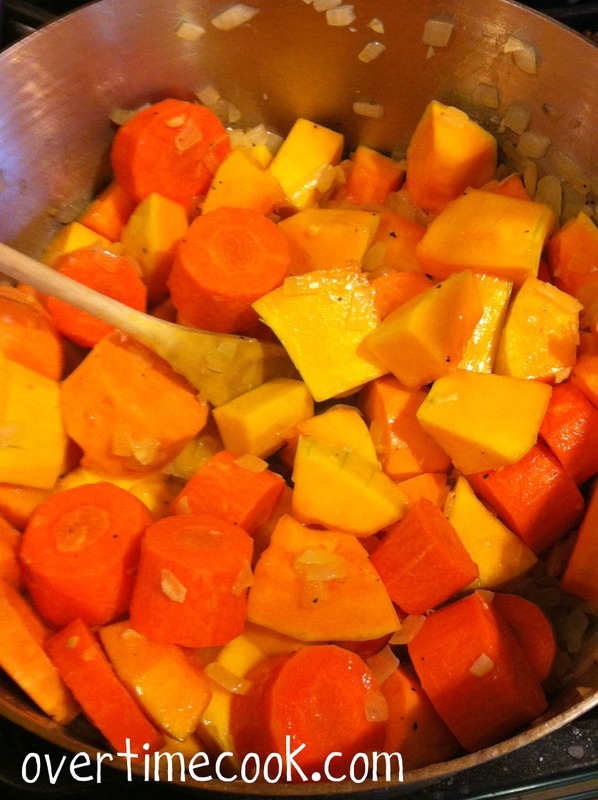 This looks great–I love the combination of sweet potato, carrot and squash. And the freezing in individual portions is so clever! (Too late for my last batches, which were frozen in large amounts). I think the step by steps add interest. Lovely soup. Love that you can sneak in a Costco run while it cooks! This was sooo good. And filling and healthy. I don’t even mind that I have four containers of leftovers, makes it worth all that muscle work chopping what must have been the three hardest items in the vegetable aisle. What kind of croutons are those? I made garlic-dill croutons out of whole wheat bread; I think they added a lot. Delicious and easy, very tasty! Yummy hearty soups are my favorite. And I love the pictures, that way you can See what it’s supposed to look like while you make it! Best soup of the season! The second time I made it with a large acorn squash because that’s what I had. I love this soup, make it all the time!! Thanks for the amazing recipe! There is no cream in this recipe, just like it says. Thank you!!! I made this soup and bought ingredients to make two of your cakes/bundts. I really appreciate how clear and easy you make my YT cooking. Have a sweet wonderful new year!! This is a perfect fall soup. It was a real crowd pleaser. So amazingly smooth and creamy! Thanks for this recipe. Can I throw in parsley? didn’t put parsley in but I did add some parsnip and it came out excellent!!! Great for these cool fall evenings. So delicious! been taking it all week for lunch!!! I put some basil in there and served it with roasted salted sunflower seeds. was a REAL HIT!! Can I use frozen cut up butternut squash? How many cups of it should I use? thanks! What can I use instead of Vegetable broth? Water and spices? Thanks, it looks and sounds so yummy! Can’t wait to try!! Water and spices should be fine. Ditto to using pumpkin. Would this be good if i substitute the butternut squash with pumpkin? Love this recipe! I am bad at estimating – about how many people does 1 batch of soup serve?